We are proud to introduce our Snowman Manis and Pedis, within our Rainbow Manicure and Pedicure Collection – this is perfect for cheeky grown-ups, who are young at heart. Take a break from “adulting,” and release your inner child. This offering is inspired by favorite fairy tales, retro toys, and nostalgic childhood memories. This collection takes your mani and pedi experience to a whole new level. Each is a celebration of whimsical fun – a unique experience you will never forget. All of the themes in our Rainbow Collection manis and pedis are safe, non-toxic, 100% biodegradable, cruelty-free, and environmentally friendly. It’s snowing in Dubai! We are the first salon in the world to offer you this service. Chill out with this super cool mani. We live in a warm, and sometimes humid/scorching hot climate. Hot, tired hands and feet? Fingers and toes puffy? Want a refreshing break from the heat? This is the perfect solution for you. Hands are “soaked” in chilly “snow”. It feels (and looks) amazing, we promise. 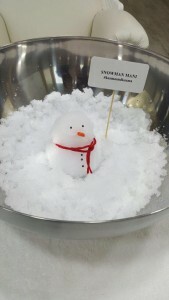 You might even be inspired to build a little snowman of your own! 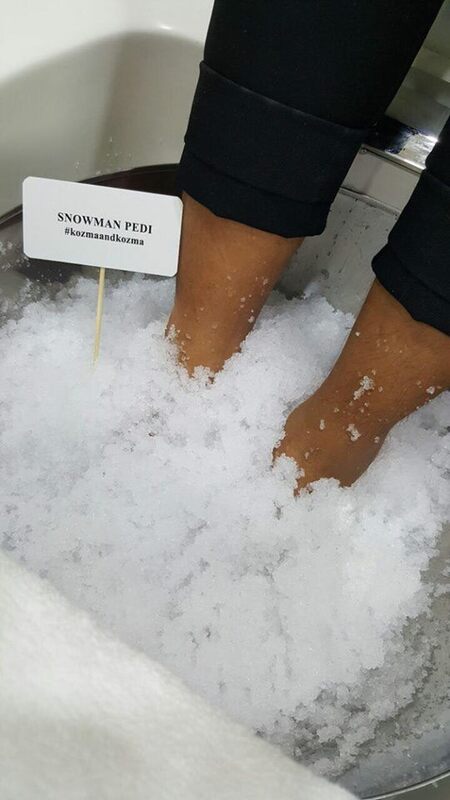 The Snowman manis and pedis have the power to melt even the iciest of moods. Winter hat and scarf not included.